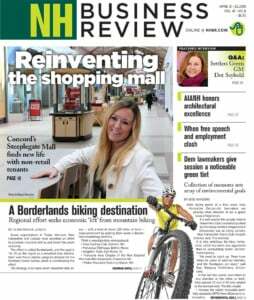 NH Business Review is the only statewide business newspaper in the Granite State. Established in 1978, NH Business Review, published biweekly, has long been seen by readers and advertisers as the most respected source of business information, news, features and advice in the state. NH Business Review is a direct-mailed, biweekly business publication reaching over 50,000 influential and affluent business professionals around the state. NH Business Review readers range from sole proprietors to CEOs and other top executives of large publicly held corporations to key government decision-makers. In its in-depth regular sections, the newspaper covers the real estate and construction industry, the high-tech sector, banking, the legal profession, health care, the hospitality industry, among many others. NH Business Review‘s online presence includes the Daily Business News Browser, an e-newsletter sent each day to thousands of business people, keeping them up to date with breaking business news and information. In addition to the Daily Browser, we also send weekly industry roundups for technology and real estate and construction. You can find the signup for these newsletters here. Click here for the 2019 NH Business Review Editorial Calendar. For editorial inquiries, contact Jeff Feingold, editor, 603-413-5118, editor@nhbr.com. Click here to learn more information about our readers and distribution area. Click here for our advertising sizes and guidelines document. Is there anything else that we can help you with or a question that we can answer?